My daughter’s betta, “Bubbles,” has been doing the “dead man’s float” in his fish tank for a few weeks now. 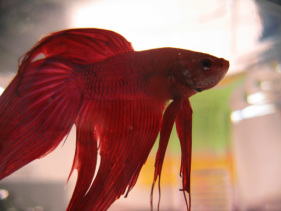 His once majestic and feathery scarlet fins now lay in a matted heap as he floats on his side at the top of the water. Thinking he’s a goner, I gently tap on the side of the tank each time I pass. But no, he flaps his little fins in response, letting me know he hasn’t succumbed quite yet. I drop a few pellets of food down to him near his mouth, and he wildly tries to right himself so he can eat. And sometimes he surprises me by swallowing a few pellets. Surely, he’s trying to hang on. Poor Bubbles. We’ve had him for nearly four years now, and he’s doing his best during his last days. He’s not quite ready yet to pass on from this life, and I don’t have the heart to flush him until I know for sure that he’s gone. As I turned 45 this past summer, I think I officially entered my own mysterious season -- middle age. And, I find that as I am plunged into these midlife years, I have more questions than answers about them. Whether we like it or not, aging happens doesn’t it? Sometimes, I feel like I’d like to do a vigorous back peddle and return to a season when I was younger – when my jeans fit a little looser, and I remembered if I fed the dog or not. But you know, tempting as it is, that would be a difficult trade off because, well, I didn’t know as much then as I do now. I have an Aunt who jokingly calls her brief moments of forgetfulness: “senior moments,” and I think that I’m suddenly realizing what she is talking about. You see, we have a God that promises to never leave us or forsake us. He was with us at our conception, and he’ll be with us till our last breath. And I’m finding that one of the exciting things about growing older is the ability to focus afresh on God’s purpose for my life. I have a friend who is “retiring” from his successful architectural business after 30 years, and now at the age of 64 is refocusing his life on a ministry he feels called to. What an awesome opportunity to use all of the wisdom and skill that God has sowed in him over the years to help others. I love it! My friend told me about the book, “Half-Time: Changing Your Game Plan from Success to Significance,” by Bob Buford. And it looks like an inspiring read for all of us who are making our way through these “middle years” and beyond. Sounds interesting right? I know what’ll be in a few of our stockings this Christmas! ​This could be a time of great opportunity, a time to look at what we really want to do – what we are really supposed to do and have at it. I don’t know that our Bubbles will be given the same opportunity that we have, but hey, if given the option, I have a feeling he would jump at the chance.